I think I can state unequivocally that this is the first and last orange I will ever endeavor to render. What a pain…I’ll take a face over fruit any day. This was, of course, for the January 2009 Virtual Sketch Date. Thanks to Jeanette for providing the reference image this month. And if you didn’t already know, there is now a Flickr Group for you to post your images to as well. Nearly there…hoping to get some time with it over lunch this afternoon to wrap it up. 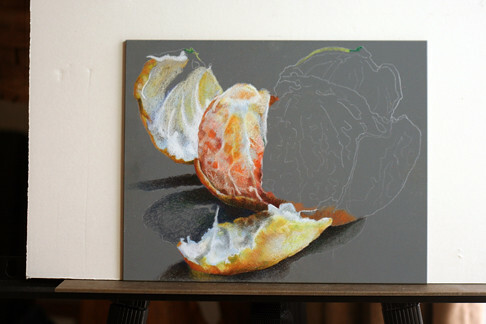 Clementine | Colored Pencil on Pastelbord | 10 x 8"
Having a rough time with the peel on the right side of the canvas…I’ve pulled up all the pigment with scotch tape and started it over twice – it may be in for a third try. What I’ve drawn here appears to be some sort of pulsating, glowing alien egg on the verge of spilling out its terrible larvae. Or maybe it’s the start of my contribution to this month’s Virtual Sketch Date…it’s pretty much up in the air right now. The center and right pears need additional work, but nearly there. The next time I post an update of this one it should be the finished drawing. I thought it would be fun to participate in this month’s virtual sketch date, so here’s the beginnings of my piece based on the reference image. I also second Katherine Tyrrell’s suggestion in the comment thread (no permalinks for comments, blogspot?) to create a Flickr group for this.